Acting as Lead Consultant and Contract Administrator/Project Manager in relation to fire restoration works following a major fire in 2007. Phased cycles of repair and redecoration works to the external elevations, including brick/stone cleaning and repair, external redecoration and refurbishment of windows, pipework and other sundry repairs. Contract value total £1.5 million. Four phases of light well restoration programmes, including repairs to glazed brickwork, structural repairs, repair of dilapidated concrete cills and full redecoration. Contract value total £1.7 million. Reinstatement and refurbishments works to 15 flats following fire and water damage, with a refurbishment budget in the region of £15.0 million. 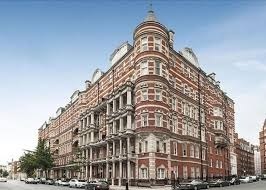 Approval and monitoring of penthouse developments with a development value of £40 million. Preparation of master plans in relation to basement development works to create additional residential and leisure accommodation, potentially adding £75 million to the value of the building. Acting as landlord’s surveyor on over 50 Licence for Alteration applications, including monitoring works on site and developing the controls/processes governing lessees’ works. Should you require any further information then please do not hesitate to contact Tim Greenwood Greenwood (timgreenwood@tg-a.co.uk, tel: 01293 804671). Albert Court suffered a major fire in 2007, with resulting damage to some 15 flats. As part of the Board’s response to this fire, a full review was undertaken of fire safety and fire precautions at the block. Tim worked closely with the appointed consultants, the Fire Protection Association (FPA) in reviewing the recommendations identified by the FPA and reporting upon the implications of these recommendations to the Management Board, and thereinafter ensuring the successful implementation of the recommendations with the on-site property management and building management staff. A state of the art wireless fire alarm and detection system was installed to all apartments, linking with intermediate transmitter ariels and relay panels to the main control panel at the porter’s desk. One of the risks identified was the presence of a charitable kitchen sited in the basement area which had operated for some 40 years, serving the students of the neighbouring Imperial College. 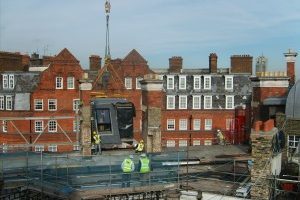 The position of this accommodation was high-risk, both in relation to the means of escape for the users and also for the fire brigade’s ability access the area in the event of a fire. Tim identified alternative accommodation within the block, re-siting the kitchen and dining room facilities and associated accommodation to basement storage vaults to the north of the building. These vaults had been used for storage over many years, were of poor quality, with compacted earth floors and restricted head height. Tim prepared, submitted and managed Planning and Listed Building submissions to the Local Authority, and after a period of 18 months, successfully obtained the necessary statutory approvals. Thereafter Tim worked closely with the Management Board and their appointed legal advisors in agreeing terms for the relocation of the kitchen and dining room uses to the northern vaults with the Management Company taking possession of the vacated accommodation. Tim worked in conjunction with the charitable kitchens’ architectural and contract team in relation to the alterations to the northern vaults to provide the necessary kitchen accommodation. These works include the excavation of floor levels to increase the storey height by 1 m, structural alterations to internal load-bearing walls and foundations, as well as alterations externally to create new entrances, and underpinning of internal and external load-bearing walls. Schedules of Condition were prepared for all flats 2 storeys above the development site which could be affected by the works. 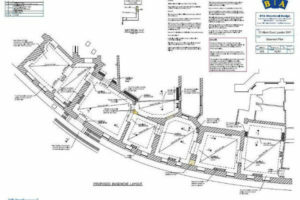 Tim has agreed detailed terms and conditions with the developer with the aim of minimising the noise nuisance and disruption to lessees in the immediate vicinity, as well as to the wider lessees’ body. Tim also guided the developer’s team in relation to a range of demolition techniques available with the aim of maximising the contractor’s productive time on site whilst minimising the risk of nuisance to adjoining flats. Tim continues to inspect the works regularly, in conjunction with the block’s appointed structural engineer. The works having commenced in mid-2013 are expected to run through to the end of 2014 before these are complete. For further information please contact Tim Greenwood (timgreenwood@tg-a.co.uk, tel: 01293 804671). Tim Greenwood was appointed as surveyor to Albert Court in 1998. 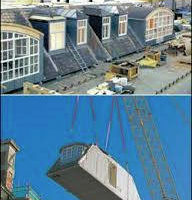 At that time Planning and Listed Building Consent had been obtained for 6 penthouse apartments on the roof. Tim discovered that the agreement between the freeholder and the developer had excluded any consideration or input from the residents or the Residents’ Management Board. Following instruction, Tim carried out an audit of the proposals, reporting to the Management Board. Tim was thereafter instructed to work closely with the developer’s team, approving all elements of construction, including temporary works, structural alterations, and construction of the penthouse apartments, acting as the interface between the Residents’ Board and the developers. Tim’s role also included inspection of the prefabricated penthouse modules in the factory, ensuring that all structural and fabric elements were in accordance with the agreed specifications. 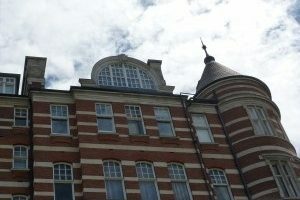 Two penthouse apartments were constructed to a shell and core stage only, following which Tim was responsible for acting as landlord’s surveyor in approving and monitoring the lessees’ fit-out works. At a later date Tim has acted as landlord’s surveyor in approving major alterations to the modular structure of one penthouse apartment as part of further lessees’ application for landlord’s approval. Should you require any further information then please contact Tim Greenwood (timgreenwood@tg-a.co.uk, tel: 01293 804671).